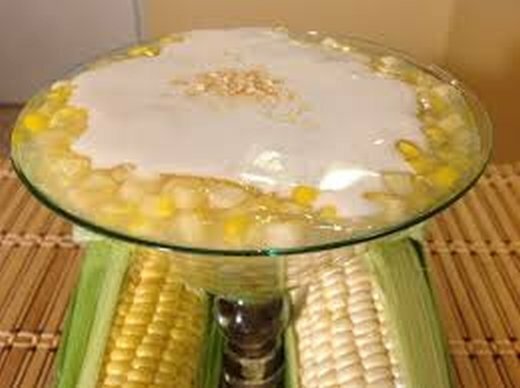 Delicious corn pudding with sweet rice and coconut sauce is delicious Khmer dessert. Removed corn’s hush and silks from corn’s ears, washed and drained. Use sharp knife to scrapes corn cobs with thin cut. In a medium pot, put corn kernels, sweet rice and water together, cook till sweet rice tender. Add salt, vanilla extract and sugar, stir well. Serve warm with prepared coconut sauce.